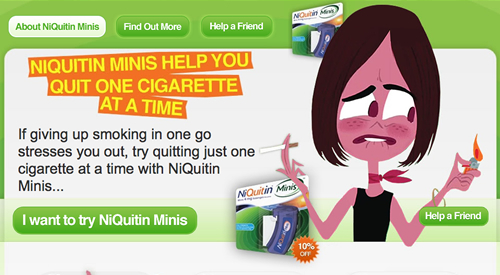 In December 2009 I developed a e-commerce application for Facebook and a Microsite to promote a new “Quit Smoking” product for GlaxoSmithKline. The application and microsite allows users to purchase a 2mg or 4mg packet of NiQuitin Minis, a tic-tac like pill which contains nicotine. Both the application and microsite used PayPal for payment processing and integration with a 3rd-party pharmacy for order fulfillment and distribution. I used the PayPal API to manage payment and an API to link with the pharmacy ordering system. The campaign lasted until March 2010 and during the time, the app and website sold over 700 units. The website and Facebook application were marketed on leaflets and on television adverts. Facebook media was also used to promote the application. This particular project was quite challenging as the website needed to meet internal and government regulations, as products with nicotine as classed as medicine. The website and facebook application took a few months to pass regulation checks, with various revisions in between. The original launch of the product was delayed from September to December, as this process took longer than expected.